one pot: corridor IIII: habitat: begins. 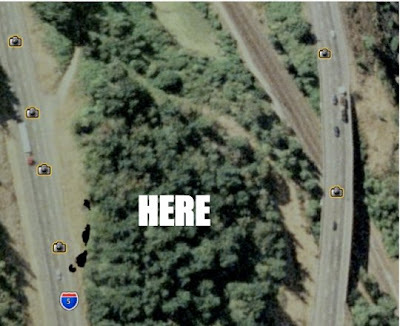 On June 22nd Michael Hebb, Hannes Wingate and Michael McManus will enter the wilderness of the Interstate 5 and endeavor to survive and create habitat in one of the freeways generous median areas. This will be a three day exploration of what it means to live, eat, and create shelter in this unique landscape. Our efforts will be documented and made manifest at the exhbition: SUDDENLY Seattle. “Can asphalt be a political territory? Is the bourgeois State and its power the street, or in the street? Paul Virilio. Speed and Politics. “The subject himself, suddenly transformed, becomes a computer at the wheel, not a drunken demiurge of power. The vehicle now becomes a kind of capsule, its dashboard the brain, the surrounding landscape unfolding like a televised screen (instead of a live-in projectile as it was before). Jean Baudrillard. The Ecstasy of Communication. Only in Marco Polo’s accounts was Kublai Khan able to discern, through the walls and towers destined to crumble, the tracery of a pattern so subtle it escaped the termites’ gnawing.